You’ve found the most reliable electrician in Melbourne! There are hundreds of electricians in Melbourne. However, few of them offer the same combination of experience, workmanship and professionalism that Briggs Electrical brings to the table! We’ve made a name for ourselves as professional and reputable electricians in Melbourne who can tackle any indoor or outdoor electrical job that’s thrown at us! From the sparky basics like powerpoint repair or installation to large-scale electrical strategies like CCTV installation or new builds, the Briggs team is ready to help you! We provide a wide range of electrical services from domestic, commercial, and emergency no matter where you live in Melbourne. Briggs Electrical is ready to respond to your electrical needs after hours, weekends and public holidays. So if you need a trustworthy electrician in Melbourne, you know who to call! You can count on us 24 hours a day; 7 days a week. We’re ready to help you out from the smallest of electrical faults to complex rewiring or lighting jobs. Every job is completed with a smile from electricians who simply love what they do! Click here to see what our previous clients have to say about us. We’ll be there when we say we will – yes, really! And if for some reason we’re running late, we’ll give you a courtesy call to keep you informed. Our team of sparkies aim to smash the stereotype of tradies. Our business prides itself on honesty and transparency, and our fixed pricing ensures you won’t find any nasty billing surprises. Residential, commercial, emergency electrical jobs… we’ve seen it all. There’s no electrical job that our team of experts won’t be able to do for you! Our team of professional electricians are fully-licensed and qualified to tackle all sorts of electrical problems. We guarantee quality workmanship and well thought-out solutions, no matter what you need. Our mission is simple: to provide the best electrical services in Melbourne! We’re committed to delivering outstanding service, whether you’re a brand new customer or a client who’s relied on us time and time again. We’re extremely selective when deciding who gets to wear the Briggs logo. Each of our sparkies is an expert in their field, with training, experience and know-how that’s the best in Melbourne. Contact Briggs Electrical today! Lodge a job or call a skilled electrician now. Electricity is dangerous, end of story. If your home or business is suffering from an electrical emergency, you must call an electrician, ASAP! Our sparkies are always on-call, so don’t be afraid to ring us after-hours. Don’t worry – it’s no hassle for us to come and help you out! 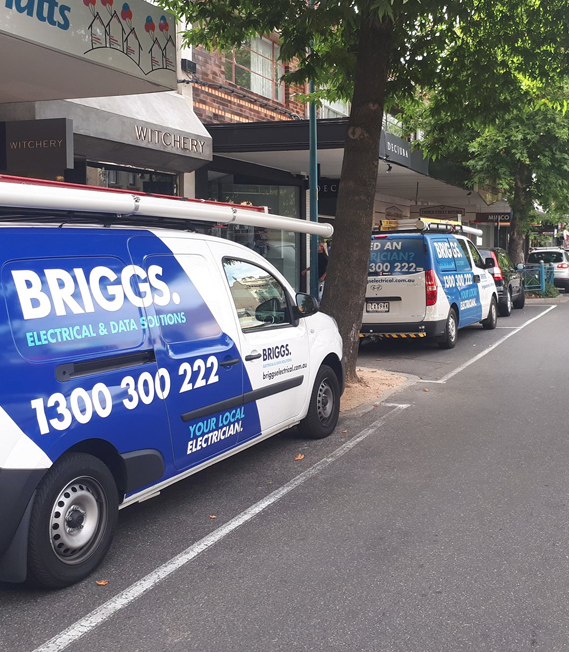 Briggs Electrical was founded more than a decade ago, and its initial mission still stands strong: delivering Melbourne’s best electrical services, no matter how big or small. During that time, we’ve serviced countless homes, businesses and more. Electrical contractors are in high demand in Melbourne. Many commercial building jobs require skills and equipment that are beyond the capabilities of your typical sole-operator electrician. Briggs Electrical is up to the task! On top of the small jobs like installing new light switches, our experience, equipment and knowledge make us the perfect choice for commercial electrical needs. When you choose Briggs as your electrical contractor, you’re choosing experience, professionalism, and knowledge. Our team of electrician in Melbourne is made up of fully-licensed and insured tradespeople, backed up by a $25 million public liability insurance. What does it mean when we call ourselves a “local” electrician in Melbourne? For starters, it means exactly what it sounds like – we’re local, and we are near you. While it mightn’t sound like a big deal, in practice it means that we can be on-scene fixing your electrical problems quicker. So you can believe us when we say we’ll be there when we say we will! While Briggs Electrical is headquartered in Melbourne’s Bayside region, our local electricians are spread throughout Melbourne’s south-east. Give us a ring and we’ll dispatch a local sparkie for installations, maintenance, and 24-hour emergency services, no matter your location. Planning a home renovation or building your own house? Whether you’re a renovator or a professional builder, electrical design and planning plays a huge role in any successful home improvement or building project. And we aren’t just talking about installation either – our electricians manage your electrical needs at each stage of the construction process. During planning, evaluate your goals and create electrical solutions that fit with your renovation plans and your budget. During installation, our licensed electricians go about the job with their trademark workmanship and skill. Finally, when everything’s said and done we’ll help clean up and help dispose of materials. We recycle as much as we can, too. No job is too big or small for Briggs. We’ll be with you every step of the process, working hard to make sure your project is a huge success. Fast and efficient service from a very nice tradesman. Excellent job. Very fast, professional and thorough. Highly recommended. Excellent communication and fantastic service. Highly recommended! The job was done very professionally. Very quick, very good price and thorough work. Great job, reliable and very professional. Professional, quick and reliable. Would definitely use again in an instant and recommend to others. Thank you David. Great job, would recommend to anyone. Great Guy who does excellent work. I would definitely hire him again and also recommend him to friends.